I’m super excited to announce this post is sponsored by World Kitchen, who I love for their gorgeous colourful bakeware. I collect both vintage and brand new dishes all the time! (No really, you should see my ridiculous collection). I have been compensated monetarily and with product. Woot woot! Why hello there gorgeous, creamy, melt in your mouth, baked dish of deliciousness. Why yes, I do wish I was eating you right now… which would be for breakfast… which might be odd, but I am still so into the idea. Cold pasta fans anyone? This dish is comfort food heaven! 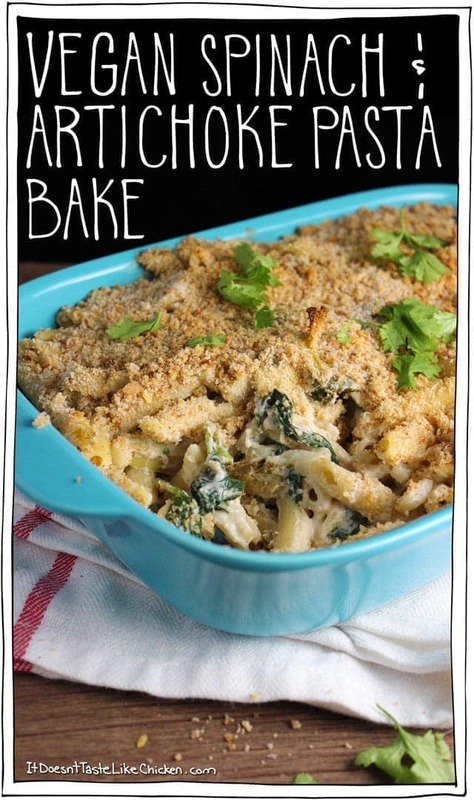 It’s like creaminess and comfort got together and had a baby and they named it Vegan Spinach & Artichoke Pasta Bake. No, not the cutest baby name I have ever heard of, but it will have to do. We can call it “Baked Love” for short. Can we take a moment to appreciate the beauty of these CorningWare dishes? 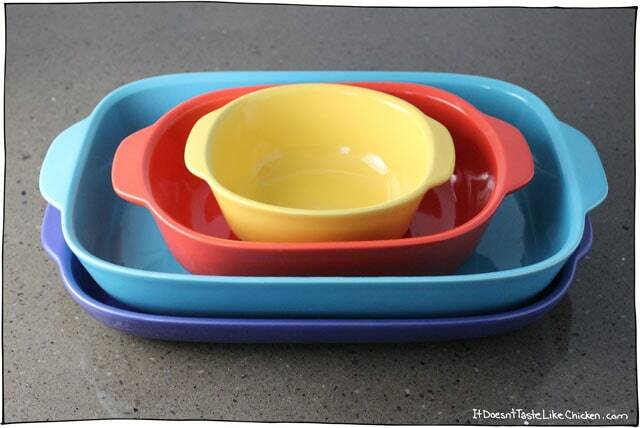 I LOVE the bright fun colours of these pans, they are just so totally me. I mean the turquoise one… I can’t even, I just think it’s the cutest. These days it seems like most of the things I own are turquoise: I’m sitting at a turquoise desk, next to my turquoise cabinet, eating cereal out of a turquoise bowl (not so secretly dreaming of eating Baked Love straight out of this turquoise CorningWare pan). So when I received this package of colourful dishes in the mail I was jumping for joy at the gorgeousness. You’ll probably see these dishes show up in a lot of posts from now on. If you’re in a shopping type mood, you can get the set shown above here, or choose from a huge range of other colours, shapes, sizes, and styles. This is a great dish for an easy weeknight dinner, but it would also be ridiculously perfect for a big party! A crowd pleaser if I ever saw one. I’m not just talking about a crowd of vegans, (where is this crowd of vegans? I want to come!) I am talking about EVERYONE. The cashews make it so sinfully creamy, an entire extra large box of spinach is crammed in there (Popeye would be proud), paired with marinated artichokes. We all know those two are a super great match. This pasta tastes just like the classic dip, but it’s all disguised as dinner. What’s that dull rumble? That’s the sound of thousands of vegans running to the grocery store to pick up the ingredients for Vegan Spinach & Artichoke Pasta Bake. Let’s get cooking! First you need to either soak or boil your cashews until they are very tender. Then add them to a blender with all of the sauce ingredients and blend until very smooth and creamy. Set aside. Melt the vegan butter and mix it up along with all the bread crumb toppings. Now set that aside too. Drain the artichokes and roughly chop leaving them still leave them fairly chunky. Chop the onion. You guess it, set those aside. Boil your pasta according to the package directions. 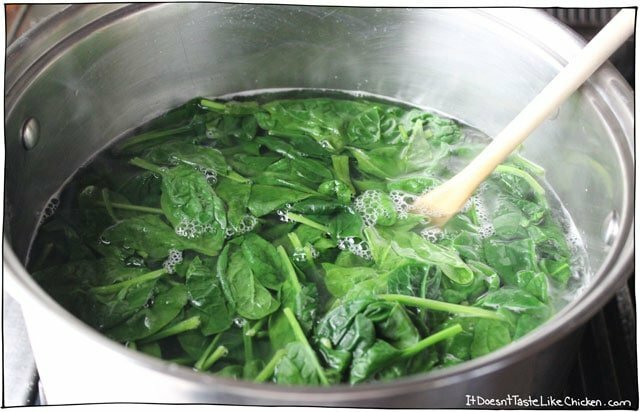 In the last 30 seconds of cooking time, add all of the spinach to the boiling water along with the pasta. Stir the spinach into the water until it is all wilted, then drain pasta and spinach together. Add the pasta and spinach back into the pot, and now add the onion, artichoke, and all of the sauce. Stir to combine. Spread the pasta out into a 9x 12 3 qt. baking dish. Then evenly shake the breadcrumb mixture overtop. Bake at 350F (180C) for 25 minutes until hot all the way through and the breadcrumb toppings have lightly browned. Feast away my friends, feast away. This is a great dish for an easy weeknight dinner, or potluck. This pasta tastes just like the classic dip, but disguised as dinner. To make the sauce: you can boil or soak the cashews. To boil the cashews: Cover the cashews with water in a small saucepan. Bring to a boil, and boil for about 10 minutes until the cashews are very tender, then drain. To soak the cashews: Put the cashews in a bowl, and cover them with water. Let soak for 3-8 hours until very tender then drain. Add the cashews along with all of the remaining sauce ingredients to a blender and blend until very smooth and creamy. To make the topping: mix together all of the topping ingredients. To make the pasta: cook the pasta according to package directions. 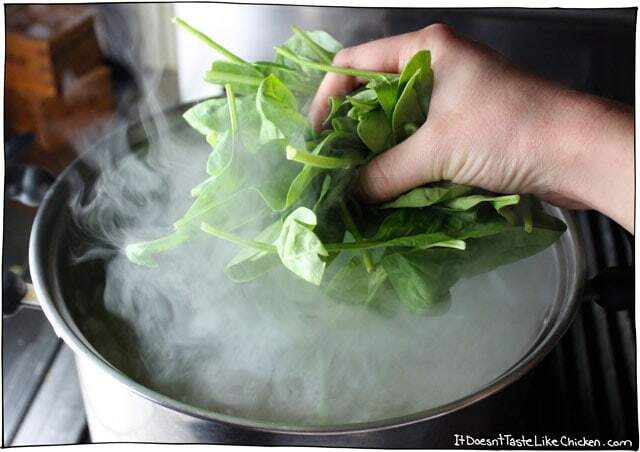 In the last 30 seconds of cooking time, add all of the spinach to the boiling water along with the pasta. Stir the spinach in until it is all wilted, then drain pasta and spinach together. 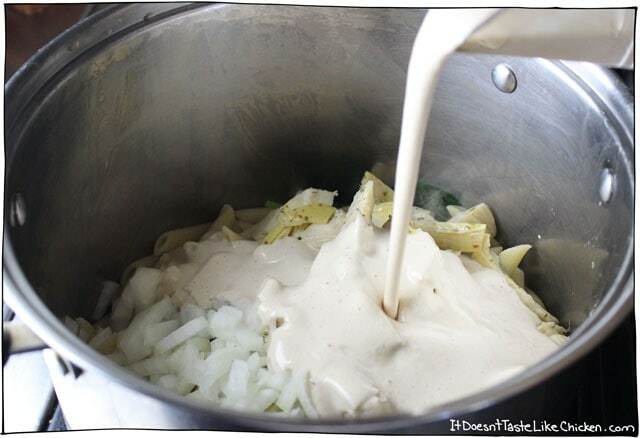 Add the pasta and spinach back into the pot, and add the onion, artichoke, and all of the sauce. Stir to combine. 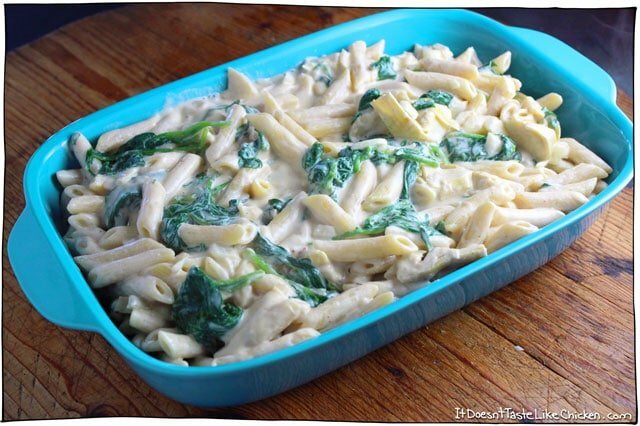 Spread the pasta out into a baking dish. Then evenly shake the breadcrumb mixture overtop. 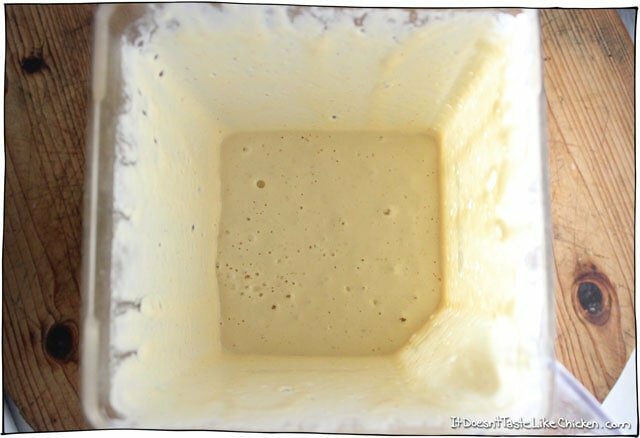 Bake for 20 to 30 minutes until hot all the way through, and the breadcrumbs are lightly browned. Serve hot. * For gluten free use a gluten free pasta such as brown rice pasta (my favourite), and gluten free bread crumbs. *For oil free, skip the tablespoons of vegan butter in the topping. Heck, I'm not vegan myself, but I'm always curious about trying new foods and am always down to try out vegetarian or vegan dishes here and there. We ended up using regular butter instead of vegan butter, since we had that on hand. But, I definitely wanna try out some vegan butter at some point though. Hi Sam, I was hoping to be able to make this the night before and just store in the fridge before baking. Any suggestions to make sure the pasta/everything doesn’t get mushy? I was going to add the breadcrumbs right before putting it in the oven. Hi Kaitlin, just make sure the pasta is just a wee bit undercooked- a firm al dente. Then you should be good. Enjoy! This is an easy recipe, but most importantly it is awesome! My family loves this and it’s now in our rotation of favorite go-to vegan meals that everyone in the family enjoys. I have one carnivore left and even she loves it! I highly recommend this recipe. Thanks! Absolutely delicious. I added some zucchini and squash, and actually added some bread in with the sauce mix to get it a little thicker ( I think I had too much liquid in there to start and did not have anything else on hand). Turned out pretty good. Thanks for the recipe! You’re most welcome, so happy you enjoyed! I made this last Thursday but I added sliced Cremini Mushroom and it is so delicious with or without the mushrooms. Of course I had to sample it before adding the mushrooms hut again either way amazingly delicious. I had enough to make a loaf pan for my cousin who is a finicky vegan…she loved it! This is so good! I made this last night with my omnivore boyfriend, and he didn’t even say “this would be better with (insert meat or cheese here)”. Instead he said “the more I eat it, the more I like it”. This is a definite win. This made a LOT for two people, so I think we’ll half it next time. I think I’ll also add a bit more seasoning too, I’m not sure how well it’ll reheat, but I’ve been picking at the leftovers today and it’s not bad cold. This was so good! 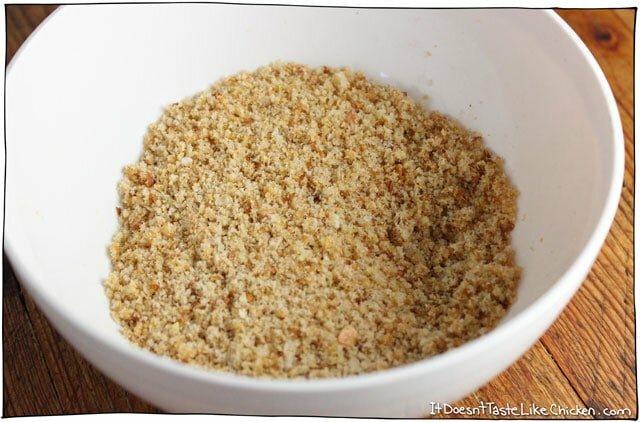 I could not find any dairy free bread crumbs at my grocery store so I used crushed up Ritz crackers which was really tasty! I topped it with Bac’n Bits (which happen to be vegan) which added a nice smoky salty flavor! Definitely will be making this again! Oooh that sounds delicious!! Great ideas! I cannot wait to try this recipe!! Do you think I could substitute the cashews for tahini? My partner has a really serious nut allergy so we can’t even have cashews in the house! That should work fine, but I haven’t tried it. If you he can eat almonds, I know blanched almonds work well. Enjoy! This was surprisingly addictive. It was even good as a leftover, which is unusual for pasta. Next time, I will up the quantity of veggies. Thanks for help feed these new vegans! I am allergic to all nuts – is there any other way to make the sauce? Unfortunately, I haven’t found anything that I love as a substitute. Some other people in the comments on the mozzarella have found substitutes they are happy with. Enjoy! Omgosh this was amazing! My parents are vegan, and I am always looking for good recipes to make for them. I did add some Daiya mozzarella cheese to it, but it was a huge hit with everyone (vegans & non vegans). It was incredible!! This recipe is a keeper! This is delicious! I made with spaghetti instead of ziti because it’s all I had and it turned out great. I try not to modify recipes the first time I try them but I did make a minor change for convenience and preference. I added the raw onion to the sauce and blended rather than putting chopped into the pasta. It added a nice flavor to the sauce and made my life easier. So happy you enjoyed it, Dawn! I am thinking of taking this to our church small group dinner. I will need to prepare it before church which is at 5 pm and serve it about 7 pm,. What is your best advice so it will still wow this non-vegan group? i don’t eat vegan butter or any oil. What alternative can I use for the topping? I would just skip the butter and use the bread crumbs, nutritional yeast, and chili powder. Enjoy! Can this be done in a crockpot? I want to take it to a potluck but know it won’t keep well if its just in a dish. This was delicious! I started Day 1 of my Vegan Challenge, and I found this recipe and your blog last week. So glad about both. I’ll definitely be trying more of you recipes. This was super delicious – I served it at Easter to a mixed crowd and everyone loved it. I don’t recommend making it the day before and reheating it as it lost its creaminess. When I make it again, and I certainly will, I will put the sauce on the pasta just before serving and just brown the topping under the broiler. Thank you Sam!!! Your recipes are wonderful! Love this!!! looks so good! how would it do if i were to prep it but freeze it? and bake at another time? I think it should work just fine. Enjoy! This is my new favorite recipe. I didn’t have enough spinach so I threw in some chopped up squash and shredded carrots. It was sooo good and easy to make. Woohoo! So happy you loved it, Megan! hi there thank you for this tasty recipe. Spinach artichoke cheesy anything is what i miss when not having dairy. the cashew sauce is absolutely amazing. I have made it for a Christmas eve party this evening and will be making another batch but with mushrooms and spinach tomorrow for the family. Havent tasted it yet but anything with that cashew sauce has to be delish. will be a staple im sure in my vegetarian gluten free non dairy house hold. Personally, I don’t think pasta ever freezes well. It would be fine it was made the day before and heated before serving if that helps. Just make sure the pasta is cooked very al dente so that it doesn’t get mushy. Enjoy! This comfort food recipe was SO delicious!!! Everyone in my household loved and devoured it, even the carnivores! It was creamy, rich, and had just the right amount of crunch. I added a 1/4 cup of pickle juice to the sauce while blending it and it gave it the yummiest cheesy flavor. Can’t wait to make this again! Can I skip the nutritional yeast or substitute it in a lesser ratio for soy sauce? I saw in a website that that could work. Just wanted to make sure it would be okay? Nutritional yeast provides a cheesy nutty flavour. You can skip it if you like, but it might be a little lacking in flavour. I would not replace it with soy sauce as soy sauce is salty and nutritional yeast isn’t. Also the brown colour of soy sauce might make the dip look a funny colour. You could try subbing nutritional yeast with a bit of white miso paste if that helps. Enjoy! Sam, I made this for supper two nights ago and I haven’t stopped eating it. I’ve had it for breakfast and lunch and supper and I can’t stop thinking about it. Next time I make it it’ll have to be when I have a crowd so I don’t end up eating the whole thing myself. So easy and delicious. Thank you so much. This is definitely on my favourite list! Fantastically tasty and creamy for the lactose intolerant. After mixing all the cooked ingredients it already tasted awesome. I would skip the baking if I didn’t have time. Great, so happy you enjoyed it Tami! Wow, awesome recipe! I was desperate to make this for aaages, and just as I was ramped up to start, I realised I had no nutritional yeast! but was absolutely craving it, so added extra saucy flavours like the garlic, lemon and salt, and use about 3-4 T of vege stock…. still tastes awesome! I imagine it would taste even better with nutritional yeast, but for anyone out there who was lacking some like me, there are other ways! Thank you for making vegan taste so good. I tried this recipe tonight and I cut everything in half as I knew it would be big. I also sauteed the onions before adding them and I included some sauteed mushrooms too. I live in a rural area so I use coconut oil for vegan butter and my crumb topping turned out great. Definite 5 stars and will make it again. It would be a great potluck offering as no one would even speculate that it was vegan. It is totally comfort food. Costco has a kilo bag of cashews for 15.99. Compared to buying meat, a kilo goes a long way so they are pretty inexpensive. Thanks again! I made this recipe last week and it was great! I live alone so made it and kept it in the fridge for a few days and warmed it up for lunches at work. My only suggestions for those that want to make it is to sautee the onion before adding it to the pasta. I found it to be a bit crunchy after baking and didn’t particularly enjoy that texture with the other combination of textures (but that’s just me – I’m weird with textures). 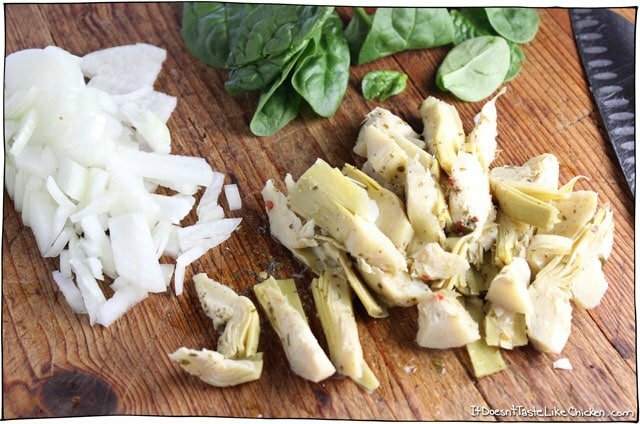 I also would have chopped the artichoke a lot more finely than I did as it ended up coming out in large chunks and was a bit overpowering even compared to the amount of pasta in the dish. All in all though, a great recipe and I will definitely be making it again for my non-vegan friends. It’s sure to be a crowd-pleaser. The above suggestions are just based on my tastes and preferences. 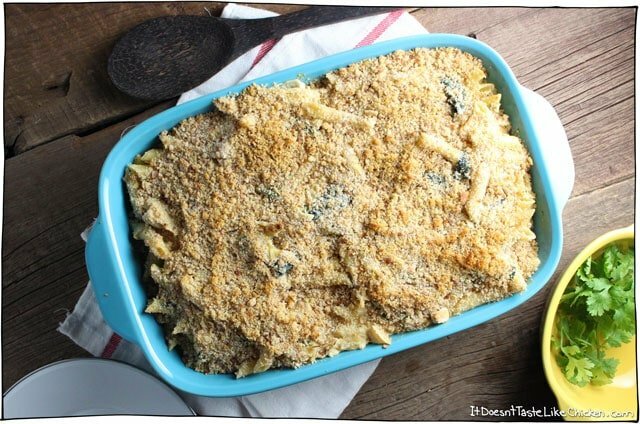 Pasta bake is my ultimate comfort food, and this didn’t disappoint!! Unfortunately I put too much lemon juice in (I only had 1 cup of cashews so adjusted the rest of the recipe accordingly – except the lemon juice! Oops!) but was able to fix it with extra salt and chilli powder. I am also super impatient so browned the breadcrumbs on the grill so I could enjoy sooner! How much does the sauce part measure out to be? I am going to have to sub cashews because of an allergy… I figure if I have the same amount of sauce whatever the sub I decide… the recipe should work out. Thanks! I don’t know what you are planning on subbing for the cashews, but if you are subbing almonds for example, it would be the same amount of almonds as there was cashews. I hope that helps! This recipe is absolutely incredible! The cashew sauce is fantastic. 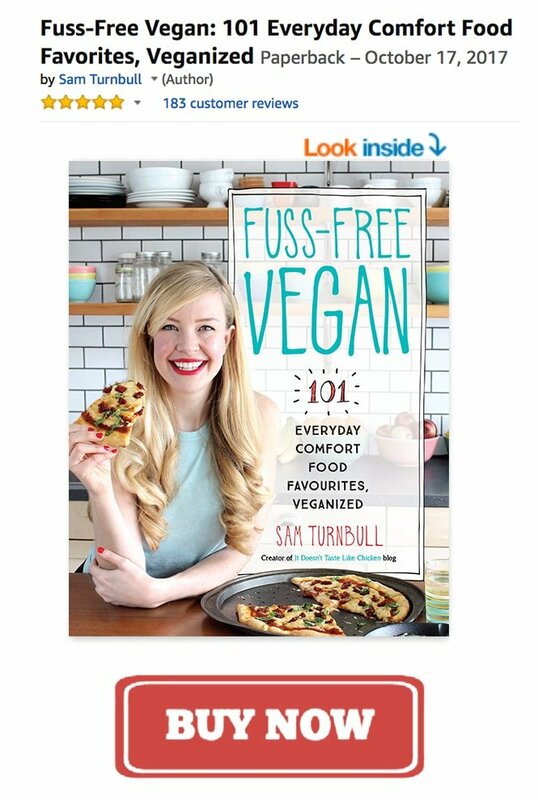 It’s tough to find vegan recipes that my carnivore daughter enjoys but everyone loved it. This will be a new “old reliable” in our house. Thank you! My husband made this for us last night. He also pro-actively found your recipe! I couldn’t believe it! I’m usually the one trawling the net for recipes! We paired it with a big salad, so we managed to get 12 servings out of it! Was absolutely delish! Thank you so much!!! This is a killer recipe! Going to keep it in my company file. Amazing….truly amazing vegan dish! Can’t wait to eat the leftovers! Husband loved it too! THANK YOU! Made this tonight. Newby vegan – decided to not tell my hubs it was vegan and made sautéed chicken on the side. He ate three helpings andloved it too! Wasn’t sure when I saw the price of raw cashews but I’m happy I trusted you now. You go girl! Thank you for sharing! My new favorite vegan recipe! Just made this for dinner and i love it! So flavorful and delicious. Pretty easy to make as well. WE made this and loved it. A couple of suggestions: I don’t have one of those heavy duty blenders so my cashew sauces are always a bit grainy. Still taste delish, but there it is. I added a couple teaspoons of the artichoke marinade liquid back to the ground cashews and other sauce ingredients and it made all the difference in texture and made it more saucy, as it was pretty thick. Also, next time I will probaby use a throw/stir method to add the spinach because it clumped up a bit. Not to worry, it still tasted great. 5 stars for sure! I just new this was going to be awesome! I was eating it right from the pot before putting into the baking pan. 2-year-old girl ate this up in record time. This is a hit recipe and one that I’ll be making again, probably soon! It was one of those meals that I was disappointed I was too full for thirds! 😛 Thanks Sam. I didn’t have a chance to make this until today. Sam, this is SO GOOD!!! I made it for lunch and my whole family devoured it. Yum! LOVE the pans! This dish looks well, DELISH! A great solution for a small crowd (because I would eat like half of it, you know?) I would eat this for breakfast in a minute – I LOVE dinner for breakfast! Haha, yeah I could probably mow down half as well. Us vegans, being all classy. Haha! Yeah, I love having this colourful addition to my bakeware! I bet you’re right, your husband will like it. I served it up to both vegans and omnivores alike and everyone loved it! Enjoy! This recipe is great. I added roasted acorn squash…I bet other veggie combinations and spice blends will be tasty too. I believe the cashew cream only works if you have a blend-tec or vitamix, though. It’s worth it for recipes like this! Thank you Alicia! 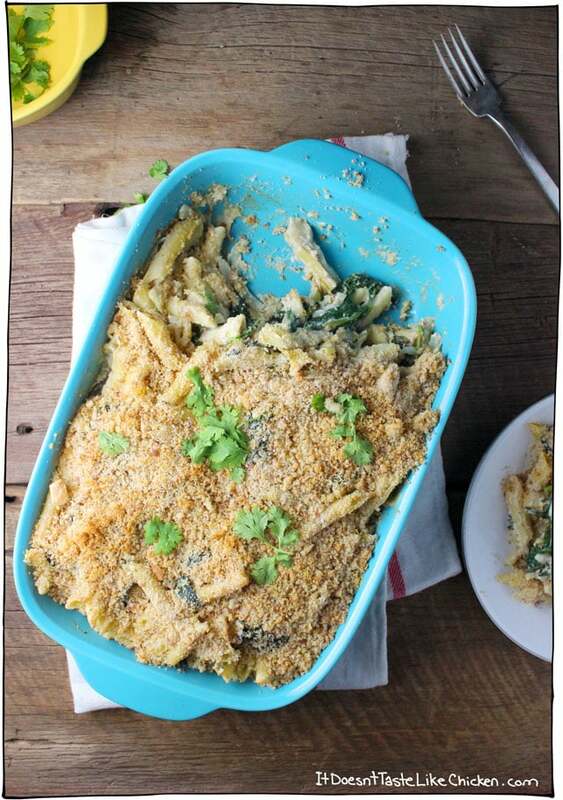 So happy you loved the recipe, the addition of acorn squash sounds super yummy and seasonal! After I soak or boil the cashews, they should be drained before putting them in the blender, right? I’m really looking forward to trying this recipe and I’ve never had the guts to try a cashew sauce before. I want to make sure I get it right. Hi Sue! Yes, you drain the cashews before putting them in the blender. I added that into the instructions just now, so that hopefully nobody gets confused, thanks for pointing that out! The secret to awesome cashew sauces it to make sure the cashews are very tender before blending, and blend until completely smooth and no cashew bits remain. I hope you enjoy the recipe! Oh my gosh Sam! I need this in my life ASAP. I already have dinner planned for the week, but may need to make a special weekend lunch. You are amazing. I am so excited when I see an email with a new blog post from you. 🙂 I’ll be back after I make it!